Aside from Australia, the United States was the only major country I had not obtained troops for playing Chain of Command. 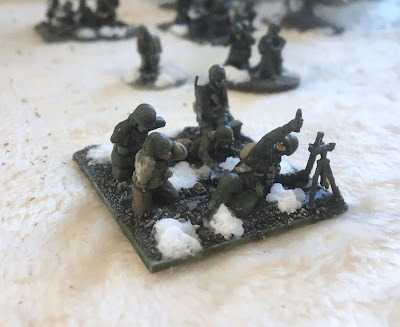 I suspect that Australian troops will evidentially get done as I have some in the lead pile for a while and I certainly have lots of jungle terrain. 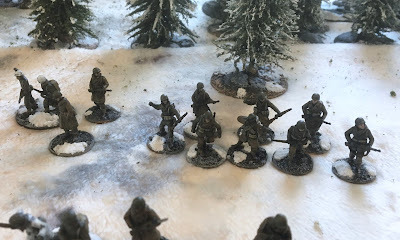 The US however presented a challenge as I wanted to do them in winter uniform, as I needed someone to confront my winter uniformed Volksgrenadiers/Panzergrenadiers. 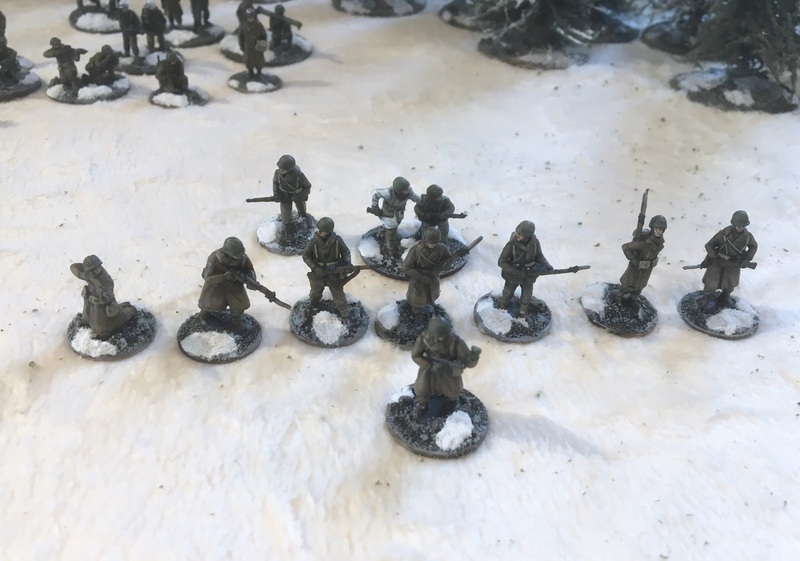 In 20mm/1/72 winter uniformed US miniatures hardly exist aside from a very limited range from TQD. 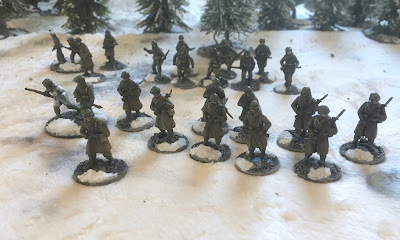 Turning to plastics was the only option, both Italeri and Revell have troops in winter uniform but the Revell miniatures just did not fit with the TQD. Fortunately for me, I had arranged for Dan Dunbar to paint the the figures and he is quite good with conversions as well as painting. 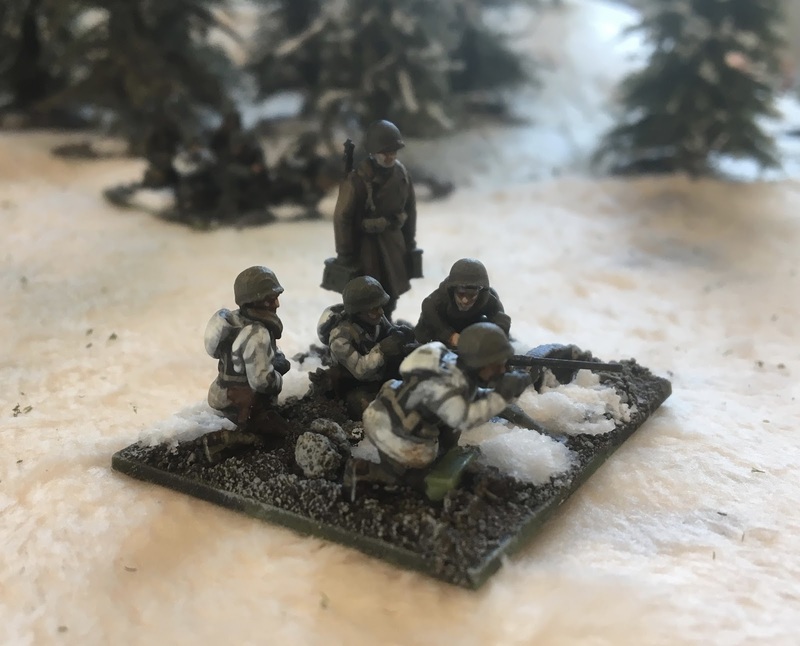 Thankfully he was able to produce what I needed from the Italeri box as well as using some miniatures from the PSC Heavy Weapons box. The only real problem left was the lack of any miniatures with BAR's but Dan was able to hack up some ESCI figures and somehow another graft them on the Italeri. The man is a genius. 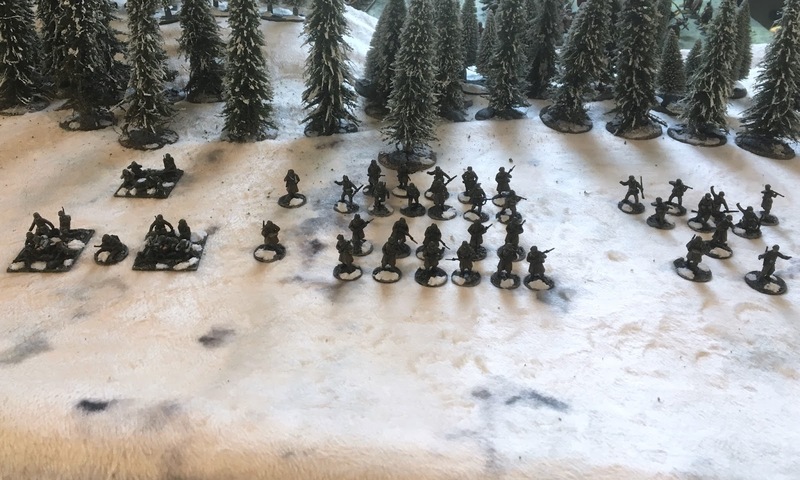 I received the troops several months ago but I hate basing so it took a while to get to them. Last week I said enough was enough and just did them. I use Elmer's Wood Putty coloured with raw umber as the base followed when wet with some sand. I then washed the bases with VMC black wash and then dry brushed this with Celestra Grey. This gave me exactly that brown-grey tone that I wanted. I then used Woodland Scenics Snow mixed with PVA glue for the snow. 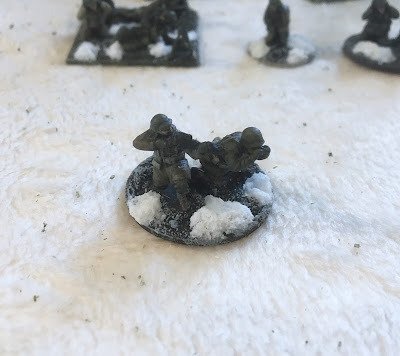 I wanted a white thick snow so there mixture was quite thick, the more glue you use the more the snow will look like ice rather then snow. 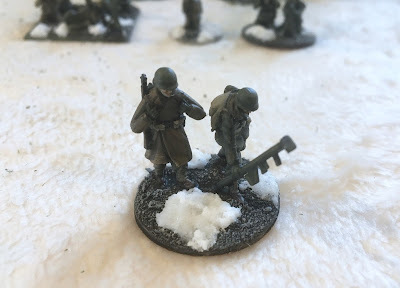 The trick here is to paint the part of the base where you plan to apply the snow mixture white, or it will look grey. 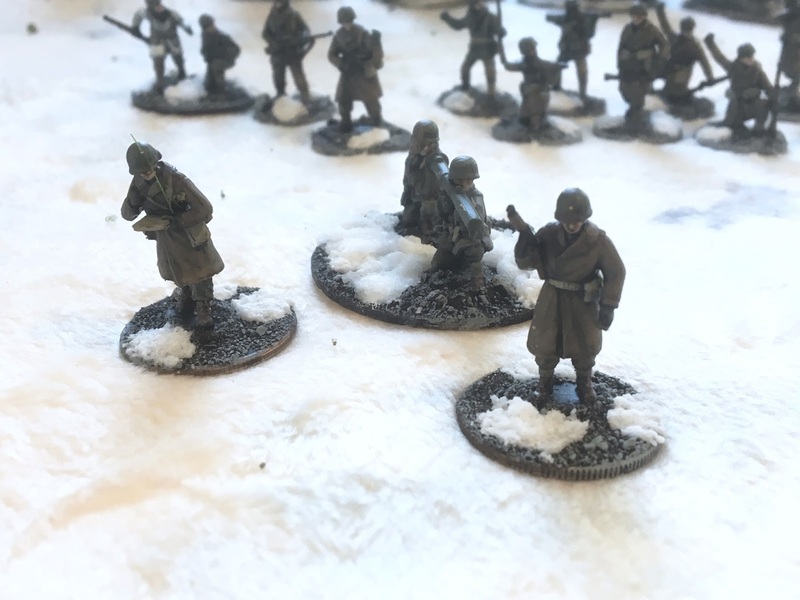 I probably will add some winter tufts from Army Painter. I put together 2 different types of platoons as well as numerous supports. I have yet to paint up any motorized transport, AFV's or Guns. Dan did paint up some gun crews for me so they are all ready. 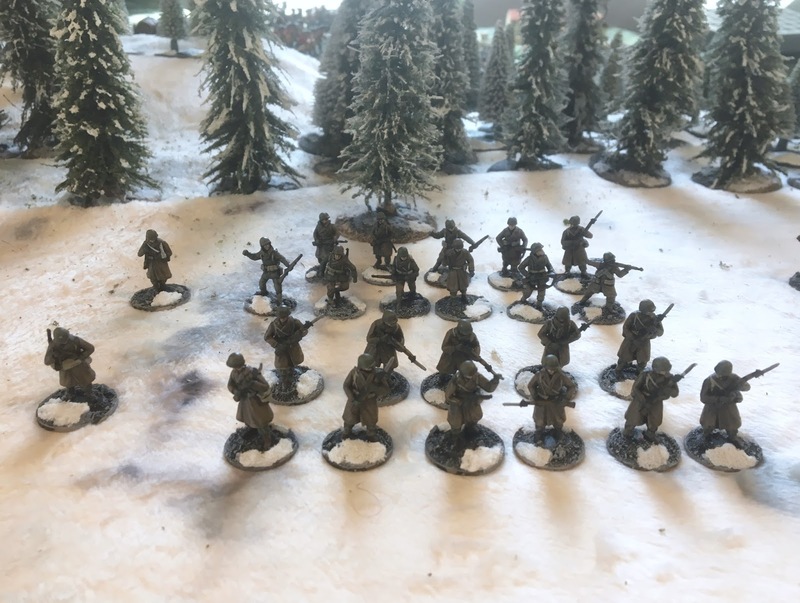 Lieutenant and Sergeant both armed with carbines as well Headquarters Squad made up of M1 Garand armed Sergeant as well as 7 rifleman. I am looking forward to getting them on the table. Wow, they came up a treat with the basing, what is your terrain made of? Is that lose powder? Looks like there are base imprints on it, very effective looking, have you seen my WIP winter Fallschirmjagers? 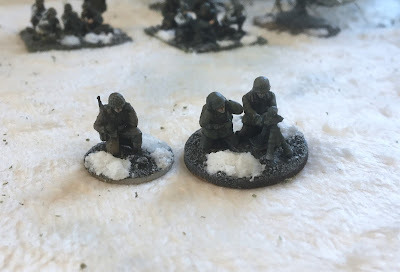 If I ever get them finished I will need to do some terrain for them. 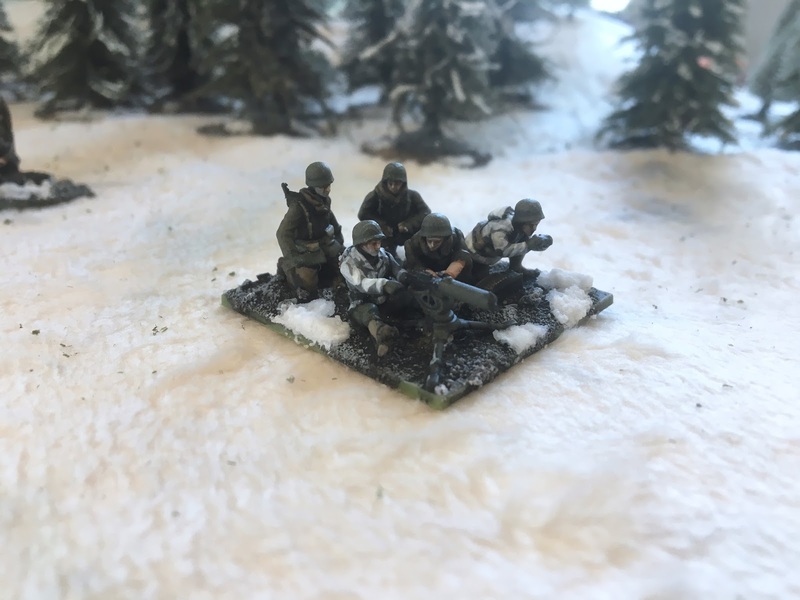 The terrain is actually the Cigarbox plush winter mat. They are nice mats but this is more cream coloured than white, I played with the temperature settings a bit on photo editing software to make it look white. I think this was a problem for them as I see that this one is not for sale anymore. Please paste a link to you Winter FJ's. Intersting I missed those, I am curious what they look like in general, I may order so. Great work John. I have wanted to do Ardennes for years, but as with so many projects, have yet to get around to it. 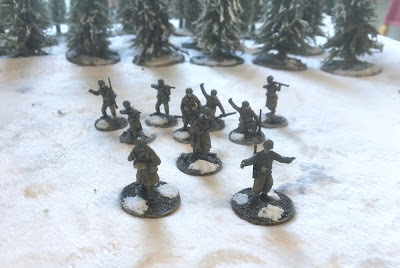 For me, contemplating winter basing is a big deterrent and I always end up deciding to paint something else, it seems. 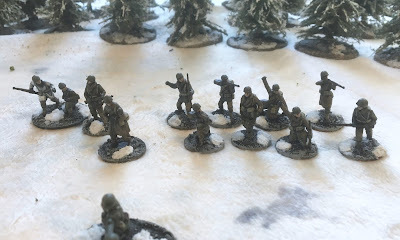 Congrats on getting these fellows done! I am in Montreal now Greg, I hear from Iannick that he is hoping to have a gaming weekend next year in Montreal. 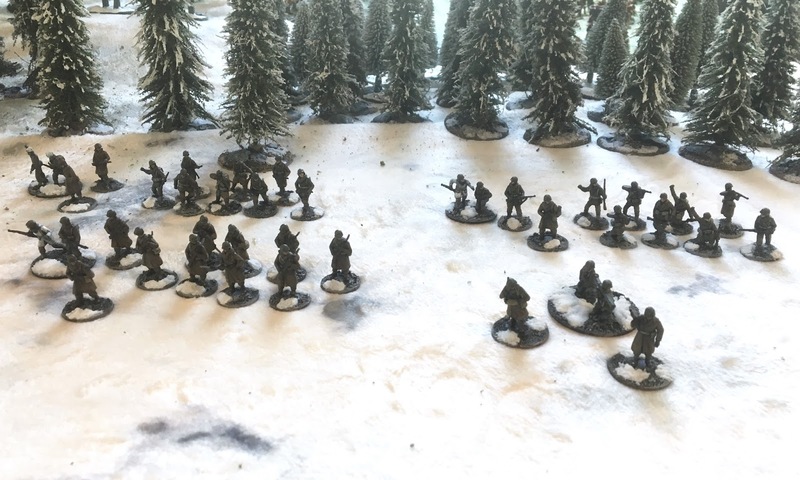 Maybe I can set up a winter CoC game. Great stuff John. I'm with Greg on this. 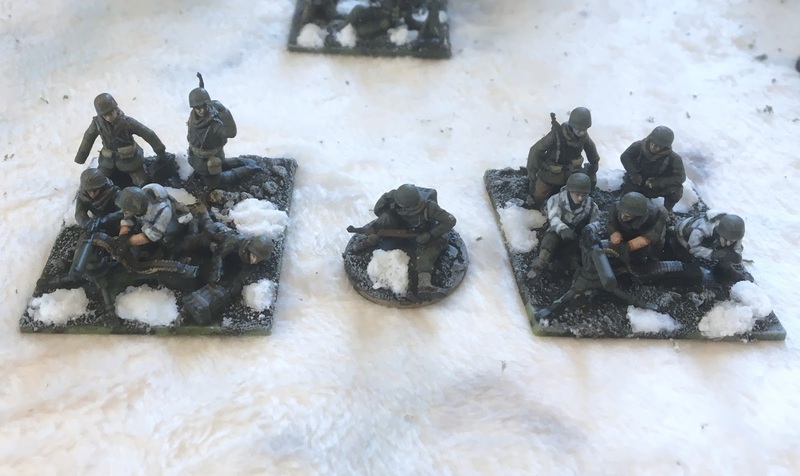 Been wanting to do it for a few years in 15mm. 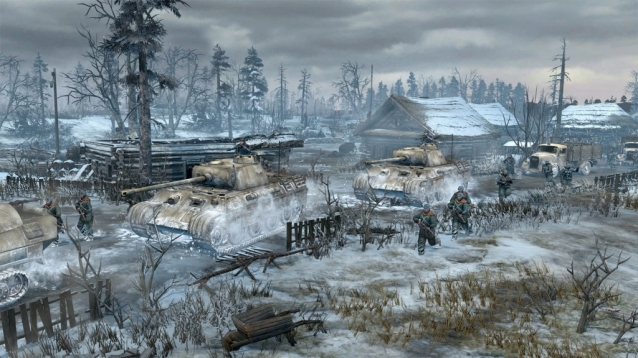 I'd like to do Hurtgen Forest for something a little brutal. ditto as to Greg, you write the scenario, I will bring the troops and terrain. 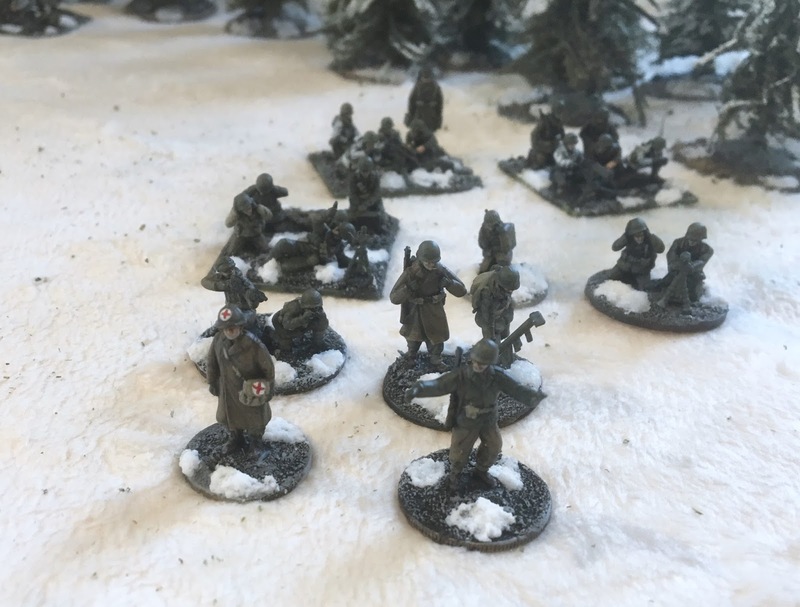 Very convincing Winter basing John, and well animated figures. I hear lots of good things about CoC. It is a great game. Thanks.